NASHVILLE — State Rep. Ron Travis is hoping fellow Tennessee House members are more willing to tie the knot this week on his bill to allow 130 Tennessee legislators and almost 1,700 city or town council members to solemnize marriages in Tennessee. 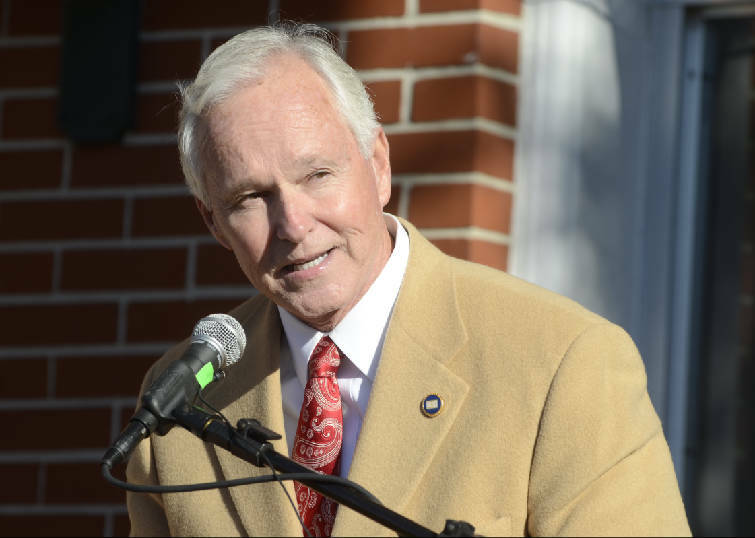 District 31 State Representative Ron Travis speaks as in Pikeville, in this 2013 file photo. The Dayton Republican last week delayed his measure, House Bill 213, as the bill appeared in hot water when his House colleagues repeatedly asked questions and aired concerns on the chamber floor. Lawmakers fretted about coming under siege from couples wanting them to preside over their ceremonies, obligations to counsel couples beforehand and other issues. One socially conservative representative worried if she could become the target of a lawsuit for refusing to honor a couple's request. Travis said his bill simply adds current and former members of the General Assembly, elected members of municipal legislative bodies and police chaplains "duly appointed" by state or local law enforcement leaders to an already lengthy list of public officials already allowed by law to preside over marriages. Current public officials who can lawfully solemnize a marriage include the governor, speakers of the state House and Senate, current and retired judges, county and city mayors, the county clerks who issue marriage licenses and county commissioners. That's in addition to a minister, preacher, pastor, priest, rabbi or other spiritual leader who must be ordained or "otherwise designated in conformity with the customs of a church, temple or other religious group or organization." Rep. Jason Powell, D-Nashville, voiced what he called "hesitancy" over the bill because it apparently would allow a legislator to ask for compensation or receive a gratuity. "I think could pose a problem given our official duties. So for that reason I will be voting no," Powell said. Democratic Caucus Chairman Mike Stewart of Nashville told Travis, "I'm a little worried that every little city council across the state and all their former members suddenly obtain this very important, solemn rite. To me I think we really need to tread carefully here." "Yes," Travis said, "every legislative body in municipalities would have the same right as the county clerks of each county and the county executives and mayors" as well as county commissioners. As other members raised concerns, Travis pointed out, "we have people in this room right now who can marry people because they were a county clerk or a county commissioner or a judge." One of them spoke against the bill. "I'm just telling my fellow members, I think I'd leave marriage to someone who can do some counseling instead of trying to find someone on a Friday afternoon," Rep. Bo Mitchell, D-Nashville, a former Metro councilman, said. "The training you're going to need is answering your phone on a Friday afternoon." Mitchell said he only performed two marriages for couples that he knew. "They're still married and so I'm batting 1,000," he quipped. "I'm going to retire right now." With Republicans openly questioning the bill as well, Judiciary Committee Chairman Michael Curcio, R-Dickson, sensing the bill could be in trouble, jumped in to point out a major purpose of the measure is addressing an existing "very critical legal problem." "We have right now in Tennessee a situation where people are going online and getting an online ordination in order to marry friends and family members," Curcio said. "Right now we don't know under the eyes of the law whether those are legal marriages. So we desperately need clarification." Travis' bill, the chairman said, "would clarify that moving forward" online ordinations would no longer be valid. "We don't want to have folks think they are involved in a legal marriage and find out later, maybe when they're going through a financial transaction or something, that they've got a legal problem on their hands." But that didn't stop the questions, including from Rep. Terri Lynn Weaver, R-Lancaster, a social conservative who noted she saw marriage as a commitment as well as a "covenant and that I do support those who bring a man and a woman together in holy matrimony." "My question to you is do I have any protections should I say no if someone would ask me will you marry us and I say no?" Weaver asked. "What are the legal clarity protections to me when I say no? Are there any legal protections that are afforded to me?" Travis sought to assure Weaver there are protections, pointing to the host of elected officials who decide whether they want to solemnize a marriage or not. "It is permissive what you want to do to ordain someone in marriage," he said. Evidently dissatisfied, Weaver replied that, "I guess what I'm rising to speak to is the religious liberties that I would like to be [permitted] to say no. So because of the ambiguity in this piece of legislation, I would not be able to support this bill." Sensing his bill was in trouble, Travis asked it be delayed until this Thursday to give him time to "answer some of these questions that you guys have and concerns." The legislation is House Bill 2013/Senate Bill 1377. Senate Republican Caucus Chairman Ken Yager, R-Kingston, the Senate sponsor, has yet to put the bill on notice.